Many gardeners plant flowering trees to add seasonal beauty, shade and ornamental interest to the landscape. Missouri lies within hardiness zones 4 to 7. Missouri gardeners should select trees according to appropriate zone, flower color, bloom season, cultural requirements and mature size. Various flowering tree varieties perform well in Missouri gardens. The flowering dogwood (Cornus florida) is the state tree of Missouri. This member of the Cornaceae family reaches between 15 and 30 feet in height and spread. Yellow-green flowers surrounded by showy, white flowering bracts appear in April and May. The green leaves turn scarlet in the fall. Flowering dogwoods prefer well-drained, acidic soils in partial shade to full sun. Missouri gardeners should use mulch during hot weather to help keep the roots moist and cool. Stressed trees become susceptible to dogwood anthracnose, borers, root rot and leaf spot. 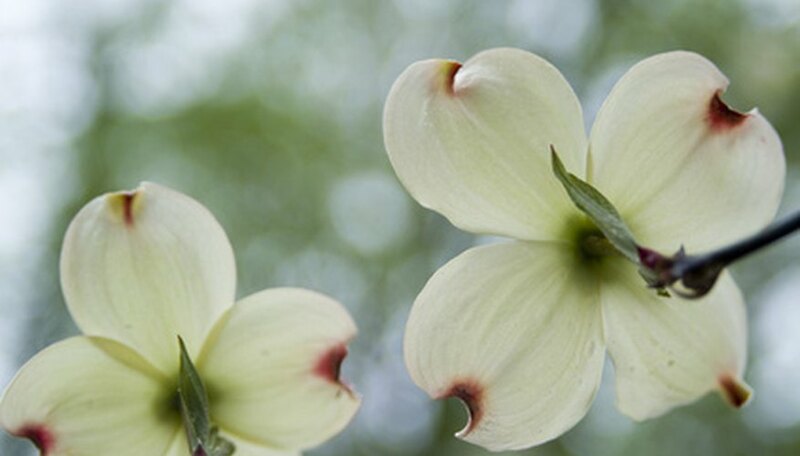 The flowering dogwood works well in native plant gardens and woodland areas. Tulip trees (Liriodendron tulipifera), members of the magnolia family (Magnoliaceae), naturally occur in the woods of southeastern Missouri. Mature trees reach 60 to 90 feet in height with spreads ranging from 30 to 50 feet. Also called yellow poplars, this tree features tulip-shaped, yellow and orange flowers that bloom in May and June. Tulip trees prefer moist, loamy soils that receive full sun. Aphids and sooty mold occasionally attack this tree. Tulip trees typically work best when planted in larger lawns. The cucumber tree (Magnolia acuminate) naturally thrives in the moist soils along the Mississippi River. Reaching to 70 feet in height and 35 feet in width, cucumber trees prefer rich, loamy soils in partial to full sun locations. Mature trees feature fragrant, yellow-green flowers that appear in April and May. The green leaves turn gold in the autumn. Cucumber trees rarely suffer from disease or pest problems. This member of the magnolia family works well as a shade tree for larger lawns. The white basswood (Tilia heterophylla), sometimes called the white linden, grows along streams in southern Missouri. A member of the Tiliaceae family, this tree reaches between 50 and 80 feet in height with slightly smaller spreads. Fragrant, cream to light yellow flowers bloom in June. White basswoods prefer moist, loamy soils in partial to full sun locations. Green leaves feature white or silver undersides. Cankers, spider mites and verticillium wilt sometimes affect this tree. Missouri gardeners often use white basswoods as shade or lawn trees. Sassafras trees (Sassafras albidum) naturally occur in thickets and fields across Missouri. Mature trees reach up to 60 feet in height with spreads of about 40 feet. Green-yellow flower clusters bloom in April and May, followed by blue-black berries that ripen in September. Their leaves turn vibrant red, purple and yellow shades in autumn. Sassafras trees planted in alkaline soils sometimes suffer from chlorosis. This tree prefers moist, acidic soils that receive full to partial sun. This member of the Lauraceae family works well as a lawn specimen.